The stomach is a bag like organ of digestive system which is present on left side of the abdomen. It is responsible for breakdown and digestion of food, specially the proteins. Normally the walls of stomach are covered by protective, thick and slimy fluid called mucus. Strong acid is produced by stomach for breakdown and digestion of food. The thick mucus covering walls of the stomach protect the walls of stomach from digestion by this strong acid. Hence, the strong acid produced inside stomach only acts on food that is present inside the stomach. When the protective mucus lining of stomach is disrupted, this results in production of open, painful sores on the wall of the stomach. These painful sores inside stomach are called stomach ulcers. The underlying tissue of stomach wall is exposed in case of the ulcers. 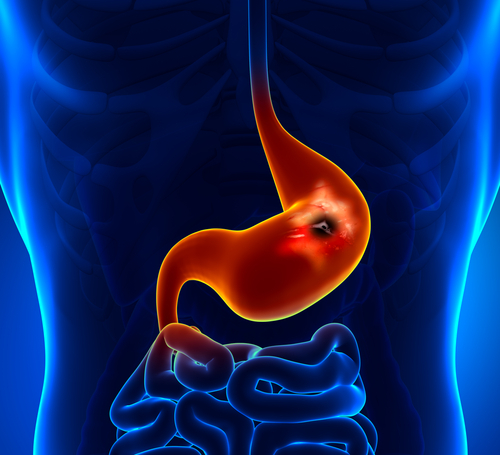 The ulcer caused by stomach acid is called peptic ulcer. There are many types of peptic ulcer (esophageal, gastric and duodenal) and the stomach ulcer is one of them. Insides of stomach are visualized on monitor using an endoscope. The endoscope is a thin and flexible tube having cameras at its rear end. That end is passed through mouth and esophagus to the stomach. Portion of stomach is taken for examination. It is a type of x-rays. It is not a common procedure but can be a good replacement if endoscope is not available. This includes antibiotics in case of infection by H-pylori, usage of drugs that reduce the acid production of stomach, usage of drugs that increase mucus production and usage of drugs that helps in healing process of stomach ulcer. In case the ulcer is very severe and is not getting better with medication and other preventive measures, surgery can be the end solution. In that case, the nerves that supply to stomach walls and are responsible for acid production in stomach are cut to decrease acid production. It is not a good choice.